Is it really already the mid of August? Hasn't really felt much like summer recently where I live and I think after the brilliant spring Islay has largely missed out on a proper summer as well. So in a way this week's Friday Islay Picture(s) might look quite fitting (even though they were actually taken in July). 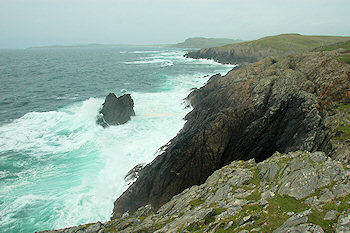 This is a view along the west coast of Islay, from just below Beinn Ghlas towards Kilchiaran and Machir Bay. After a few bright hours earlier it had clouded over that afternoon and with rain threatening to come in from the sea it had turned fairly gloomy. It wasn't particularly windy, but the swell coming in from the Atlantic was still causing some nice waves breaking over the rocks and cliffs in the area. 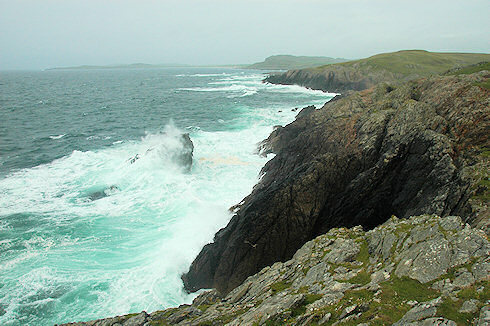 This rock outcrop is just south of Bun na h-Aibhne, below and just north of Beinn Ghlas. I quite like watching waves breaking over rocks and cliffs, sending spray up into the air. The waves were obliging here, providing a nice view. I suspect it will look much more interesting though on a really stormy day, although you (and your camera) will be quite exposed in this area (with the associated spray and water). Either way, a nice place to just sit or stand and watch nature showing off its power. With that thought I wish you a great weekend, whatever the weather holds, if you have a summer or not. There probably won't be much, if any, Islay blogging here until earliest Sunday afternoon. My sister is over from Germany, I'm going to pick her up from Wales on Saturday, we'll then spend the weekend together until I drop her off at Heathrow on Sunday afternoon.